The F2280 Deskjet from HP is designed for users looking for an affordable and easy to use the all-in-one printer. It is multifunctional which means that whether you are photocopying books, scanning images or printing documents, the HP Deskjet F2280 stands out good. 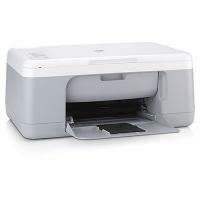 With a low cost of HP Deskjet F2280 Ink Cartridges, the printer is quite affordable and easy to use. HP printers are known for their reliability and are built to last for a long. It is quite disappointing to know that the printer lacks a display screen and is in turn controlled by a certain number of buttons and warning lights. These warning lights appear when there is low ink in the cartridge. The advantage of this printer is, that it can be accommodated in a room easily as it occupies less space. The printing is excellent and has no quality deterioration. But the colour graphics and photographs print quality are not the best and images suffer from contrast and fading issues. The printing speed is not impressive at all, the scanning and photocopying is further slow as compared to printing. There is no network functionality attached to the printer. The HP Deskjet F2280 printer is not at all bad for using it at home for printing, scanning and photocopying purposes. One can benefit from the low cost of HP Deskjet F2280 Ink Cartridges. On the whole, the HP Deskjet F2280 printer is a multifunctional printer and quite easy to use. It is affordable, reliable and will definitely withstand the test of time, making it good for use. How to handle the HP Deskjet F2280 ink cartridges of the printer? Hold the HP Deskjet F2280 ink cartridges by their black plastic sides, with the label on the top. Do not touch the copper coloured contacts or the ink nozzles. NOTE: Handle the print cartridges carefully. Dropping or jarring the cartridges may cause temporary printing problems or even permanent damage to the cartridges. You can easily keep a check on the ink supply level to determine how soon you might need to replace a print cartridge. The ink supply level shows an estimate amount of ink remaining in the print cartridges. Actual ink levels may vary. NOTE: If the print cartridges were used before being installed in the product, or have been refilled, the estimated ink levels on the level tab may be inaccurate or unavailable. NOTE: Ink from the cartridges is used for the printing process in a number of ways, including in initialization process, which prepares the product and the cartridges for printing, and also in printhead servicing, which keeps print nozzles clear and ink flowing smoothly. In addition to this, some residual ink is left in the HP Deskjet F2280 ink cartridge after it is used. For more information refer its manual. In the HP Solution Center, click Settings, point to Print settings and then click Printer Toolbox. Click the estimated ink level tab. Q. Are HP21 and HP22 cartridges made for HP Deskjet F2280 printer? A. Yes, these ink cartridges are compatible with HP Deskjet F2280 printer. Q. The HP Deskjet F2280 ink cartridges that I installed in my HP Deskjet F2280 printer aren’t fitting properly. I tried a lot but nothing is helping. Why’s that and what should I do? A. Please take your HP Deskjet F2280 ink cartridges out one more time and follow the procedure of replacing and installing them. Check whether the cartridges are now properly locked in the cartridge holder. If they aren’t locked properly even after you follow these steps, there’s a chance that the cartridges are not compatible with your printer; it is likely you need to get them exchanged. Q. Do you happen to stock a set of HP Deskjet F2280 ink cartridges that have an extra in black? I have to print more of text documents and less in colour, so I need an extra black and don’t want a big multipack now. A. Yes, we have a 3-pack premium compatible set of these cartridges with two black ink cartridges and one in colour. It is a value pack that will suit you better as it will save you more and you won’t have to buy a separate cartridge in black. Q. Since compatible cartridges aren’t brand new and have been used as originals previously, do they wear out faster? If that happens, do you solve the issue or don’t, considering that we chose compatible cartridges to cut costs so cannot expect assistance? A. We provide complete support and all the assistance you require for compatible ink cartridges. They are not worn out about work like brand new as they are restocked with ink or toner and then are subjected to the strictest quality tests before selling. Please rest assured that any issue in your compatible cartridge is solved with total commitment and promptness. Q. The HP Deskjet F2280 ink cartridge is leaking and the ink is all over the place. What should I do? A. Please wipe the ink stains immediately with dry or damp cotton cloth. If the ink spills on your hands wash it thoroughly with warm water and soap. Make sure to use a lint-free cloth if you are wiping the ink stains off the machine. Q. When I try to print using my HP Deskjet F2280, I get a wrinkled or sometimes torn paper out of the machine. What could be the problem? I am using paper as per the HP media type specifications. Please help. Thanks. Load the paper correctly. Do not stack more than 20 to 25 sheets in the tray. Fan the paper or tap it firmly on a hard surface and then position the papers correctly. Carry out a self-test page with the machine. If you find out that the paper prints out successfully than the product is working fine. Q. Will HP Deskjet F2280 ink cartridges work with HP Deskjet F370? A. Yes. The HP Deskjet F2280 ink cartridges are compatible with HP Deskjet F370 printer. If you would like to know the list of printers that are compatible with these ink cartridges please check https://printerinkcartridges.ie/a-multi-saver-pack-hp21-hp22. Q.After I have installed printer cartridge in the HP Deskjet F2280 printer the LED of printer cartridge status blinks and the error message Print Cartridges missing is displayed on the computer screen. How do I resolve it? A.If you have recently installed the HP Deskjet F2280 ink cartridges then make sure that you have removed all the coverings and packaging from the cartridges. Do not touch the electrical contacts on the cartridge. Q. I own an HP Deskjet F2280 printer. Please suggest the cartridge replacements for the same. HP Premium Compatible Ink Cartridge HP C9352AE (HP22) High Capacity cartridge at 21ml! Q. I am using HP Deskjet F2280 printer. I want to know the high quality cheapest toner cartridges to print the photos. Can I use Compatible Ink Cartridge HP C9352AE (HP22) alone? A.The compatible HP Deskjet F2280 ink cartridge works best with the printer to deliver high-quality photo prints. The cheapest option would be to buy the multipacks available on our website to make your photo prints affordable. No, you cannot use Compatible Ink Cartridge HP C9352AE (HP22) in both the cartridge holder. Q. How can I print with one cartridge in HP Deskjet F2280 printer? A.You can use ink backup mode if only one of the HP Deskjet F2280 ink cartridge is installed. The text and photo print quality will differ from those when you use both the cartridges. Q. I see lines and spots on my printouts from the printer HP Deskjet F2280? A. If you have recently changed the HP Deskjet F2280 ink cartridges make sure that you clean your printer with a soft clean cloth.It might be the case that the ink might have spilled while replacing the old cartridges so you must remove the cartridges and wipe off the ink gently with a clean soft cloth. Now reinstall the cartridges and print several pages and if you see no improvement in the print quality then you must check the drum roller of the printer for any damage. Q. I want to purchase cartridges for my HP Deskjet F2280. Can you deliver the tomorrow? A.Your HP Deskjet F2280 ink cartridges will be dispatched on the same day if you place your order before 12 pm. There is a high probability that your order will arrive next day provided you are not staying in the remote locality. If you require any bulk orders to get delivered next day you need to contact our customer care team on chat or the toll free number provided. Q. Why my compatible new HP Deskjet F2280 Cartridges are not printing? A.The cartridges with attached printheads usually have this problem.There is a possibility that your HP Deskjet F2280 Cartridges are kept flat or upside down for weeks before they are used so, in that case, make your cartridge stand upside down before you use them. You can a damp paper towel folded in quarters and set the print head down onto it for 3-4 minutes.This will help the printhead and pull the ink out. If the cartridges still do not work then you can get your order replaced by following guidelines of the return policy.